Stars are not scattered uniformly across the seas of space. They are collected into huge disks, spirals, and globular forms that may contain billions of stars. These may be more than 100,000 light years across, but they are often millions of light years apart. Hence, they have occasionally been called "island universes". Astronomy before the Space Age was mostly concerned with stars and star clusters. It was not until 1924 that the existence of galaxies beyond our own Milky Way was firmly established by the then-new 100-inch telescope at Mount Wilson. Once scientists were convinced that those dim, fuzzy patches in the sky actually contained hundreds of billions of stars, a new astronomy was started. It was quickly realized that galaxies come in different shapes and sizes. The most numerous ones are dwarf galaxies like the Magellanic Clouds, two satellites of our own galaxy. Dwarf galaxies are small and often irregular, but even they can contain a million to a billion stars. 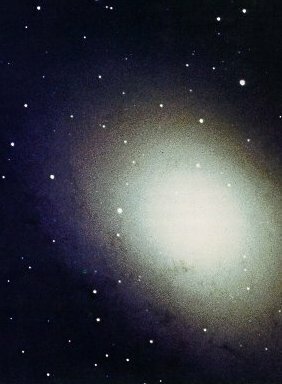 At the other end of the scale, some of the very biggest galaxies are elliptical in shape, ranging from almost spherical to very elongated like a football. Many people, scientists and nonscientists alike, feel that the most beautiful galaxies are the spirals, such as the famous Andromeda galaxy, whose mass amounts to half a trillion suns. Our own galaxy, the Milky Way, is a comparable spiral, although the details of its structure are hard to determine from within. Besides the normal spiral galaxies such as Andromeda, there are spiral galaxies with a bar across the middle, the spiral arms trailing like pennants at the end of the bar. As ground-based investigations of galaxies proceeded, it was soon learned that far-off galaxies are receding, and that the more distant the galaxy, the faster it is moving away from us. This discovery was a major achievement of the 100-inch telescope at Mount Wilson, and it provided the impetus for the Big Bang theory of formation of the universe. Studies of the detailed appearance of galaxies also revealed several new types. Among these are the Seyfert galaxies (named for the American astronomer Carl Seyfert), which have very bright central nuclei. The spectra of these nuclei reveal the presence of hot gases in rapid motion. Other remarkable aspects of galaxies were found when radio telescopes were developed. After some galaxies were found to emit intense radio waves, more detailed observations of these radio galaxies showed a characteristic double-lobe structure of the radio-emitting regions. These lobes typically are located far beyond the visible structure of the galaxy. The amount of energy required to produce the lobes is immense, some times equal to the output of a galaxy over its entire life. Later it was found that at the centers of some radio gal axies there are very intense radio emitting cores which could not be spatially resolved even with the biggest radio telescopes. The character of the radio waves showed that these sources must be very small - in some cases as small as the solar system - and yet somehow they produce enormous amounts of energy. This has been further corroborated by infrared measurements. Another unusual galaxy, known as Centaurus A, has been the subject of some exciting space observations. Centaurus A has a typical double-lobe radio source, but in addition there is an inner pair of lobes, spaced along the same axis as the outer lobes. Within these inner lobes there is yet another, unresolved source of radio emission. In addition, Centaurus A produces a tremendous amount of high-energy radiation. The gamma ray telescope on HEAO-I revealed that Centaurus A emits gamma rays with energies up to 1 million electron volts. Another experiment detected gamma rays from Centaurus A with even higher energies of 100 billion electron volts. The latter, very high-energy gamma rays produce showers of electrons in the Earth's atmosphere. X-rays are also emitted from the inner radio lobes of Centaurus A. In addition, there is ajet, visible to X-ray telescopes, that extends from the innermost core to the northern inner lobe. The existence of thejet indicates that the lobes are constantly resupplied with energy from the active, but still mysterious nucleus of the galaxy. The nearest neighbors to our own Milky Way galaxy are the Magellanic Clouds, about 150,000 and 190,000 light years away. 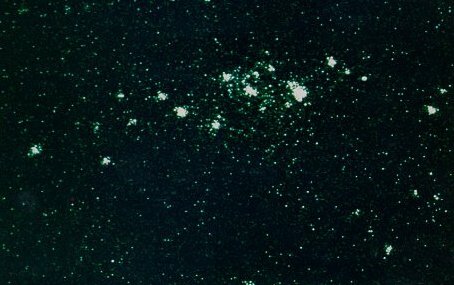 To observers in the southern hemisphere they resemble luminous clouds several times the size of the full Moon, but the Magellanic Clouds were not well explored until recently, when large telescopes were built in the Southern Hemisphere and airborne telescopes conducted far-infrared observations. In the Magellanic Clouds, our satellite observatories are finding the kinds of X-ray sources that we earlier discovered in our own galaxy: binary stars, supernova remnants, and others. In addition, the most intense gamma ray burst yet observed, the event of March 5,1979, apparently came from the Large Magellanic Cloud. Gamma ray bursts are a relatively new discovery from orbiting satellites. Many objects in the universe emit gamma rays fairly steadily, but these sudden eruptions of gamma rays from a single point typically last a few seconds to tens of seconds, during which they outshine the rest of the universe in gamma rays. We think that the sources of typical gamma ray bursts are somewhere in our own galaxy, perhaps as close as 20 to 50 light years from Earth. But if the intense burst on March 5, 1979 came from as far away as the Large Magellanic Cloud, being the release of energy must have been truly enormous for the event to seem so bright at a distance of 150,000 light years. The direction of the source of this burst has been determined with great precision by combining measurements from nine different spacecraft, and it lies near the heart of a supernova remnant in the Large Magellanic Cloud. Perhaps an unusual neutron star left behind by the supernova explosion was the actual source of the gamma rays. 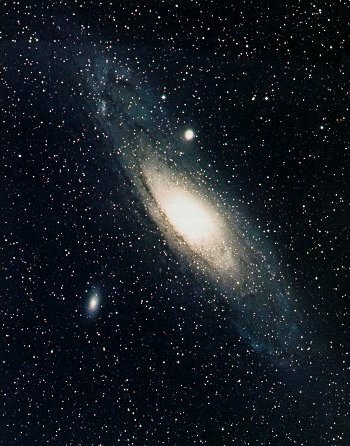 Our next neighbor galaxy is the Great Spiral Galaxy in Andromeda, the most distant object visible to the naked eye. It is as large as or larger than our galaxy and is about 2 million light years distant, yet emits only about one-tenth as much energy in the form of infrared radiation as our galaxy. X-ray images taken with a telescope on the HEAO-2 satellite revealed more than 70 X-ray sources, which appear to be binary stars and super nova remnants in this neighbor galaxy. Deep in the heart of Andromeda. Seen in a new, way, M31 central region was imaged in its own X-rays by an instrument on the HEAO-2 satellite. Strong sources of X-rays (bright spots) are few enough to count, but more common near Andromeda galaxy's center than in the nuclear region of our own Milky Way. Observations made at intervals show that the intensities of many X-ray sources are changing. We have just discovered that our own Milky Way is surrounded by a corona, a very thin atmosphere of hot gas. The sources of the corona probably are the bubbles of hot, thin gas that pervade the interstellar space in our galaxy. Some of the bubbles probably expand to such enormous sizes (thousands of light years in diameter) that they must actually break out of the disk of the galaxy altogether, in jecting hot gas into intergalactic space. 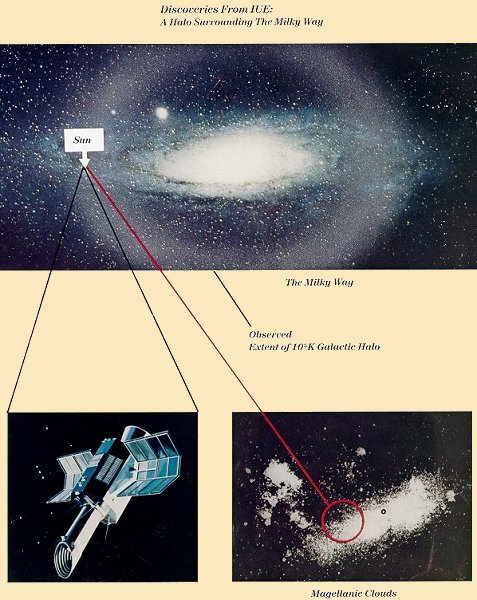 Much of the hot gas remains bound to the galaxy by gravitation and thus forms the invisible corona at a temperature of about 100,000� C.
Because the galactic corona produces no visible light, it could not be seen until the launch of the International Utraviolet Explorer (IUE) satellite in January, 1978. IUE found evidence of the corona in the form of ultraviolet absorption lines in the spectra of bright blue stars in the Magellanic Clouds. The measured Doppler shifts of the lines proved that they are produced by foreground gas around the Milky Way, rather than in the Clouds. Our Milky Way galaxy is surrounded by a galactic corona of thin hot gas. 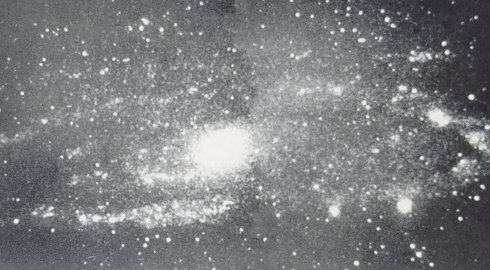 The corona was found when the International Ultraviolet Explorer (lower left) recorded the spectra of hot, bright stars in the Large and Small Magellanic Clouds, two neighbor galaxies of the Milky Way. The spectra showed dark lines identified as absorptions by gas in the corona. The gas rotates along with the Milky Way, so it is not simply a medium in which the galaxy is embedded. Similar observations now reveal coronae around each of the Magellanic Clouds and at least on other, more distant galaxy. Some coronal gas is not gravitationally bound to our galaxy and must expand into the space between the galaxies. The scales of distance here are immense. Galaxies are tens to hundreds of thousands of light years across, but the distance between galaxies is typically a few million light years, a million times the average distance between stars in our galaxy. Even if Voyager, with its great speed, could escape our galaxy, it would take 30 billion years for it to reach the Andromeda galaxy, much longer than the present age of the universe! In places where galaxies cluster together to form a group millions of light years across, the escaping hot gas between the galaxies is revealed by its X-ray emission. With the X-ray telescopes of HEAO-2, we obtained images of the gas in such clusters of galaxies. We have even found clues to the age of the gas. For example, in clusters where the gas has only recently emerged from its parent galaxies, it is still clumped around them, as revealed by the patchy appearance of the X-ray images. In more evolved clusters, the images are smooth, showing a diffuse, centrally-peaked distribution of hot gas. These differences in the X-ray images of clusters of galaxies are correlated with differences in the types of galaxies in volved. Spirals seem to be associated with the patchy X-ray emission. Thus, X-ray observations are providing basic clues to the evolution of giant systems of galaxies. We have only a few tantalizing clues just now, but the picture should become clearer after the launch of the planned Advanced X-ray Astrophysics Facility in the late 1980s.